The farmers in Burkina Faso have been quietly fighting climate change. Over the past three decades, the poorest farmers in the West African country produced food for half a million people by restoring some 300,000 hectares of degraded land with innovative techniques, says a Reuters report. 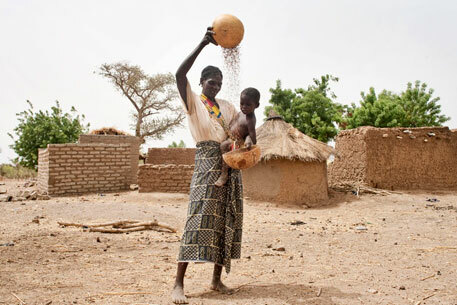 “While malnutrition and poverty remain major problems in Burkina Faso, the fact that farmers can still produce food during extreme droughts has helped the region to avoid famine,”Amanda Lenhardt, research officer at the UK-based think tank Overseas Development Institute (ODI), told Reuters. Landlocked Burkina Faso, which ranks 181 out of 187 countries in the United Nations Human Development Index, remains one of the world’s poorest nations. “The reclamation of unproductive lands in such a climatically vulnerable region by resource-constrained farmers is an achievement by any standards,” Lenhardt added. According to ODI, restoration of up to 10 per cent of arable land in the Central Plateau region of the country was even more remarkable considering that a third of the world’s productive land was experiencing degradation. Agriculture accounts for 35 per cent of Burkina Faso’s gross domestic product and employs about 85 per cent of the population, Reuters reports. One of the sustainable techniques employed by the farmers includes ditches to collect water. Lenhardt said that information about these methods was disseminated by farmers’ groups and national organisations. “It is important to ensure that these practices are implemented within communities instead of just being introduced to individual farmers. There must be discussions with farmers from the ground level, instead of visiting organisations simply imposing their ideas,” she said over phone from Ouagadougou. This is nothing to do with climate change. Climate change word is serving as an adjective. The agro-climatic conditions were studied by me in 80s. They are published in my book published in 1993. Tend to agree with Reddy garu's views. This inference is assured when secondary sources particularly Reuters etc. are relied upon without cross checking. The least that could be reported is to highlight the factors on a) CC changes and b) critical elements of action plan.